First cut a 6" x 9 1/2" piece of pink card stock and fold it in half for the base, a 4 1/4" x 5" piece of green for the front, a 1 3/4" x 6" piece of white for the strip, a 3 3/4" x 3 3/4" piece of pink for the image background, and a 3 1/2" x 3 1/2" piece of white for the image. Then stamp the green card stock with a stamp from the Stampin' Up! Gorgeous Grunge set in Old Olive ink. Next stamp the white strip with a Stampin' Up! Hardwood stamp in Crumb Cake ink, then on the white square,stamp the flowers and stems in Stazon Jet Black ink. Next watercolor the stems and flower centers with an aqua painter and an Old Olive ink pad then color the petals with a Stampin' Blendabilities Pink Pirouette marker set. Then stamp the flower on a piece of scrap paper, color it the same as the others, cut it out then attach it to the center flower with a mini pop dot. Next cut out the labels for the sentiment with Spellbinders Labels Four dies and stamp the sentiment with a stamp from the Stampin' Up! Wetlands set in Crumb Cake ink. 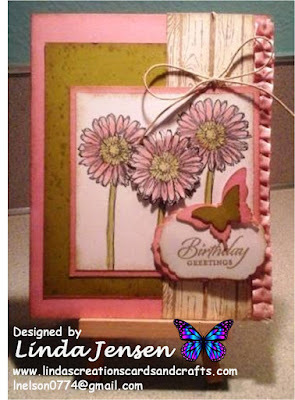 Then punch the large butterfly out of pink card stock with a Stampin' Up! Elegant Butterfly punch and the smaller one out of green with a Bitty Butterfly punch. Then start assembling the card. First sponge the edges of each piece with Crumb Cake ink then attach the green card stock to the base. Next tie Stampin' Up! Hemp Twine around the strip, attach it to the base over the green card stock, then attach the Stampin' Up! Blushing Bride Pleated Ribbon. Next attach the flowers to their background then to the base over the ribbon. Then attach the sentiment to its pink background with a mini pop dot then to the flowers with another mini pop dot. Finally attach the butterflies to each other then to the sentiment with mini pop dots and enjoy!